SPW042529 SCOTLAND (1933). 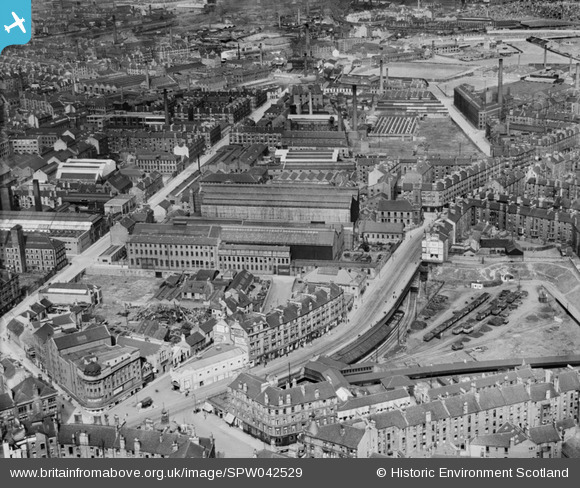 Glasgow, general view, showing Duncan Stewart and Co. London Road Ironworks, Summer Street and Broad Street. An oblique aerial photograph taken facing north-east. Title [SPW042529] Glasgow, general view, showing Duncan Stewart and Co. London Road Ironworks, Summer Street and Broad Street. An oblique aerial photograph taken facing north-east. Miller's Linoleum Stores as they were known then. Sign says: "Scotland's Leading Linoleum House"
Next door to the right was the Salvation Army offices and hall, then when it was left abandoned the Orange Order took it over now known as Olympia House... Tommy Gilmours gym was on the opposite side of Olympia street.. I lived in Broad st when this was all tenements next to Templetons at St Marnock st.. I lived in Fordneuk st and Broad st and cant remember anywhere looking like that photo.. I lived there from the 40s..
Dont recognise this street at all and lived there in the 50s 50s 60s..
Barrowfield Park, home of Bridgeton Waverley F.C. The park was built around 1927 and remained in use until around 1939 when it was demolished to make way for the Barrowfield housing estate. According to the aerial view, it looks as if Barrowfield swings were on that piece of land. As far as I know this was never a mill... it was a stationers seemingly at first then used by the Naval stores during WW2.. my aunties worked in it then... then it became Gilmour And Deans printers until the 60s.. then an upholserers factory. Now the Dementia Resource Centre..
My auntie lived above the Grange Pub.. on the corner of Arch street.. The pub was the last thing to survive of old Camlachie , only the council houses of the 30s still are there. Officially Whitevale depot. Opened 1/7/1894, closed 14/10/1922 & replaced by Parkhead depot.